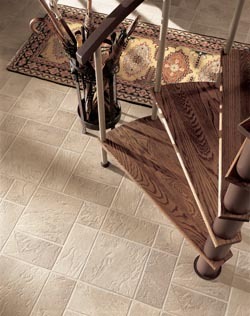 Upgrade outdated flooring with luxury vinyl floor tile or luxury plank flooring and add beauty and value to your home. Get the results you desire by investing in a worthwhile home improvement project like flooring replacement. If you want new floors that satisfy in both style and durability, choose luxury vinyl tile from our most attractive collections. Unlike the vinyl products of years past, the latest vinyl lines are designed to look and feel like your favorite flooring materials. Not only will luxury vinyl improve the appeal of your home, but it will also improve the value of your home. This guarantees you are more than satisfied with your investment far into the future. If you are ready to start shopping for vinyl floors today, don’t hesitate to consult our local flooring store. With so many attractive vinyl styles to choose from, you are sure to find an option that satisfies in all respects. Finding the ideal vinyl surface for a single room or your entire home doesn’t have to be a challenge. Turn to our in-store associates and take advantage of invaluable assistance that puts you one step closer to finding the luxury vinyl tile of your dreams. We take the time to understand your expectations in look and price, allowing us to make helpful recommendations during the selection process. The selection of vinyl tiling we offer includes products that closely resemble residential favorites, such as ceramic, porcelain, travertine, marble, and more. As a client of our flooring business, you also get to choose from luxury plank flooring that mimics the appearance of popular wood species. No matter what you have in mind in terms of stains, grains, or finishes, we guarantee there is a luxury plank product perfectly suited to fulfill your desires. Each individual plank of this vinyl flooring is even uniquely textured to provide the wood-like feel you’ve always wanted. Once the vinyl planks are placed in your home, we guarantee only you will know they’re not the real deal. Don’t risk the longevity or durability of your new floors by entrusting installation to the inexperienced. Turn to us for luxury vinyl tile installation that continues to impress for years to come. We offer installation services performed by technicians with years of hands-on experience. The knowledge and skill gained over impressive careers allows them to complete even the largest installation projects in a timely manner. Because we remain so confident in the work of these installers, our business offers floor warranties and guarantees unparalleled by the competition. Our store and showroom is proud to provide a vast selection of luxury vinyl tile. Contact us by calling <PHONE> or using the on-page form and discover the different vinyl lines and collections available. We proudly serve Twin Falls, Mountain Home, Chalice, Sun Valley, and Stanley, Idaho, as well as the nearby communities.